Ready to Grow Your Own Food Without All The Backbreaking Work? Want to grow your own food but put off by all the digging, weeding, and watering involved? Do you carry memories of hours of weeding in the summer when you were a kid? There is a way to eat your favorite vegetables warmed by the sun without the backbreaking work your parents or grandparents might have done. It’s called Vegetable Gardening the Easy Way – and it truly can be easy! 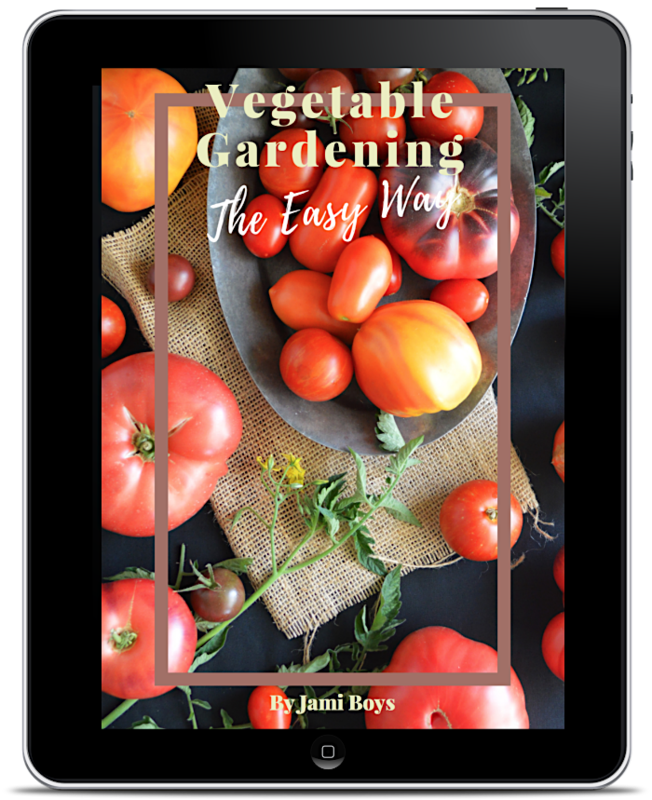 Vegetable Gardening the Easy Way includes the specific tips and techniques I’ve developed and used through years of growing vegetables for my family that actually work to minimize the tasks of digging, weeding, and watering. There are specific directions on how to set up a garden from the beginning that will work with you and not against you. And if you already have a garden, you can use this as a guideline to adapt what you already have to lessen your garden chores. You’ll find all the steps needed to walk you through a season, helping you to plant and grow your own produce. 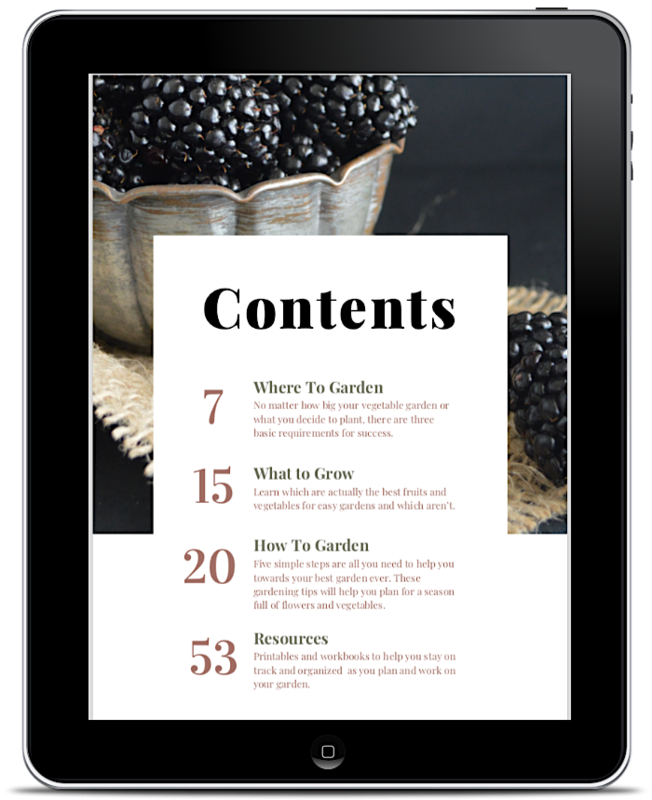 Plus, you’ll have access to a rich resource of printable materials to use every year that will help you plan, organize, and keep up with growing and harvesting your food. Tips for locating your garden. Five steps to design an easy-care garden. 10 money-saving plants to grow. Other vegetables you may want to grow. Take your garden from dream to reality in 4 easy steps. The nitty gritty on starting plants from seed – and how to care for them as they grow. How to plant seedlings and transplants. Pest & disease management tips. You get all this in one easy-to-find place for just $9.99! Long time AOC readers may recognize this content from almost a decade of sharing my garden tips, techniques and how-tos. The content for Vegetable Gardening the Easy Way is all here on the blog, but isn’t always the easiest to find. Which is why I decided to put it all together in an easy to read – and then easy to do – format, with chapters that are arranged to take you through the planning stages all the way through to harvest. I have spent most of the past 20 years trying to figure out the least labor intensive ways to garden and that’s what I want to share with you. I want everyone to know that gardening on any level is something we can all do no matter what time we have – or don’t have! And now YOU can have garden success, too – for just $9.99! Vegetable Gardening the Easy Way is a digital item – you will not receive a physical product. The file will arrive to your email immediately upon purchase (if you don’t get them, check spam). The files are in PDF format, .epub, and .mobi. You may need Adobe Reader to view and print the PDFs. Adobe Reader can be downloaded for free here for Mac users or here for PC users. Alternatively, you can print using Chrome Browser or your computer’s pdf reader (like Mac’s Preview). To read using the Kindle app on any device, I’ve found the best way is by using the Send to Kindle app right on your desktop. You simply drag the PDF file to the desktop icon (after downloading) and it will appear in your Kindle app. Much easier than dealing with .epub or .mobi versions (though both of these are included in your file).